BOLT ON TECHNOLOGY’s automotive repair software is a guaranteed tool that will boost profits, increase productivity, retain customers and help you communicate with customers easier than ever. When you become a BOLT ON customer, you will see change almost immediately. Not only will you love the simplicity that our technology offers, but your customers will rave about the service. Here’s 7 foolproof steps that give you a glimpse into how our software helps increase cash flow for your shop. Is sloppy handwriting a problem? Not anymore. 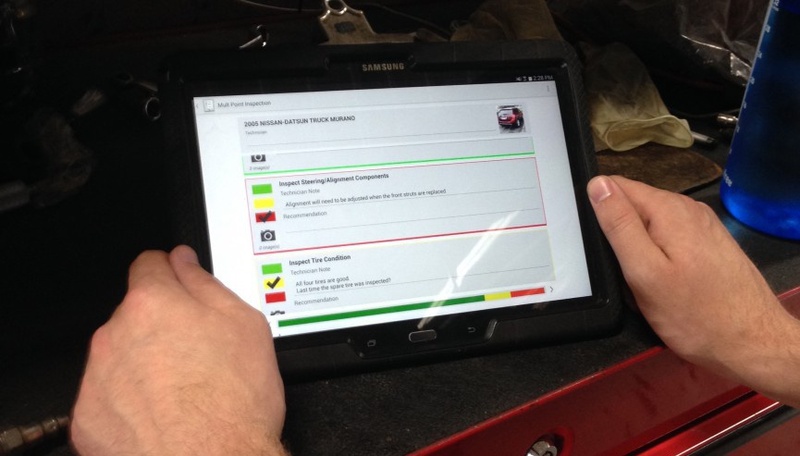 Our auto repair software allows technicians to speed up the multi-point inspections and repair order process; leaving more time to service more vehicles. No need to hire more staff or adjust work schedules. Productivity, and, in turn profits, can be increased by incorporating our innovative automotive software. Don’t explain it, show it! 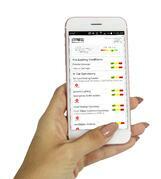 Send digital vehicle inspections sent directly to the customer. Getting each and every letter and number of the vehicle identification number (VIN) correct, and making sure it's readable, is something that every shop struggles with. 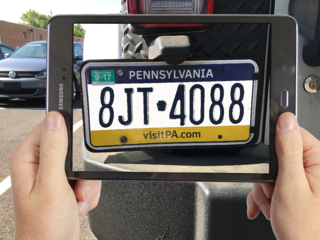 With Mobile Manager Pro, scanning a VIN and/or license plate eliminates the need to decipher messy handwriting, lessening the likelihood of mistakes, and saving precious time. You will also get all vehicle info, saving even more time! 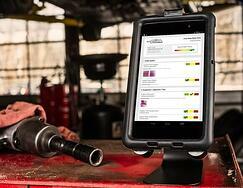 This is an efficient way to increase auto repair shop productivity. Our research has shown that nearly 75% of vehicles only come in for an oil change. However, more than likely they’re also in need additional services. Did you ever have a car owner come into your shop saying, “you didn’t tell me my car needed that fixed?” Or “why didn’t you remind me?” Our software takes care of that for you too so you can continue to earn repeat customers. To learn more about increasing loyalty among your customers, read How to Earn Repeat Customers. Shop management software alerts service advisers and techs to all pending services and recommendations when a customer arrives. The recommendations are even color coded to help them understand the severity of the issue. This technology also maintains a vehicle service history and offers suggestions that are either pending since the last appointment or are due for regular maintenance. But one step further, it can set next appointments for those repairs that can wait a few months to be fixed! With wireless automotive repair software solutions, techs can meet customers at their vehicles and begin the digital inspection, repair order, and estimate process right then and there. No more waiting in line, or running back and forth from the owner’s car to the service desk. Welcome Station Kiosk – Allows the customer to check themselves in and upsell themselves on services when they arrive at your shop. Start the Orders on the tablet and get all necessary info. A picture speaks a thousand words. Sometimes, customers aren’t always sure that their car actually needs certain repairs, so prove it with a photo or video. Our software gives you the ability to text images to your customer, along with notes and recommendations. 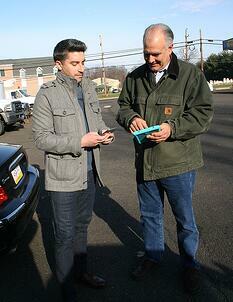 Our auto repair software will also save it for when the customer returns. All too often, customers think that shops exaggerate the severity of service suggestions, just to make more money. 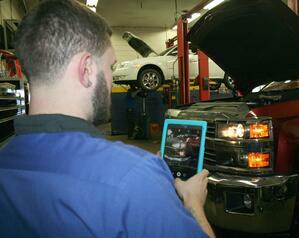 Showing them pictures can increase repair order revenue from 15% to 90% on average. It's much harder to refuse brake work when they can see the issue themselves. And now that you customers are seeing the needed repair, you are building a new level of trust with them that is so valuable for return services. Communication has changed, and text is the preferred way to connect with today’s customer. They will respond quicker to texts than with phone calls. Built-in text and email functionality enables techs to seamlessly send estimates, multi-point inspections, photos, and more, directly to customers, speeding up customer approval times to get the job done faster, saving you time and money! This speeds up customer approval times from the national average of 1 hour and 17 minutes to a mere 37 minutes. BOLT ON TECHNOLOGY allows your relationship with your customer to become more transparent. You can show them what needs to be fixed and why. It also remembers customer and vehicle information. It brings you to an entirely new personal level with your customer that will keep them coming back your shop time and time again. 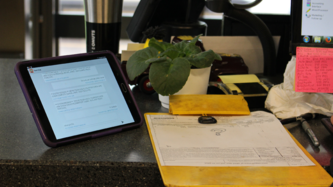 Don’t forget that our software will also remind your customer of when their next oil change is due, further car maintenance, and more. The service process tends to get in the way of what you do best, diagnose and repair vehicles. BOLT ON TECHNOLOGY will change the way your shop runs, how you relate with customers, and increase shop profits by an average of 39%.